Join us for a stripped down performance and live interview with two of the greatest bassists in metal history, Frank Bello (Anthrax) and David Ellefson (Megadeth) of Altitude & Attitude. 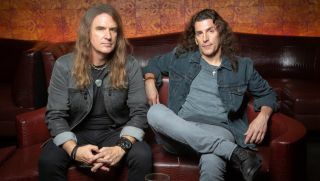 Altitudes & Attitude Share New Song, "Late"
Collaboration between Anthrax’s Frank Bello and Megadeth’s David Ellefson will release debut album January 18. Megadeth bassist David Ellefson has teamed up with Pro Tone Pedals to launch a chorus box that holds the power across low end notes when the effect is engaged. Over the weekend, Megadeth bassist David Ellefson announced plans to release a new pedal, the Dawn Patrol Chorus, the result of hisrecent collaboration with Pro Tone Pedals. Megadeth bassist DavidEllefson recentlystopped by the Guitar World studio in New York Cityto discuss—and play—his fivefavorite Megadeth bass riffs. Rock and roll tell-all books are a dime a dozen. Countless rock veterans have joined forces with ghost writers and tossed band mates — former and current — under the proverbial tour bus. Over the weekend, Megadeth posted another behind-the-scenes clip from their Super Collider recording sessions. Lately, a musician releasing a book is nothing unusual, and Megadeth bassist David Ellefson has joined the fray, releasing Unsung: Words & Images, a self-published book of his lyrics and photograph.